Dwight Jacobus calls his boat an "outboard cabin launch". Though he lives in Kentucky, he trailered PARASOL 1000 miles to southwestern Florida to launch her on January 15, 2003, after spending 15 months constructing her. PARASOL is of plywood-epoxy construction, with full details available at www.journeyboats.com. 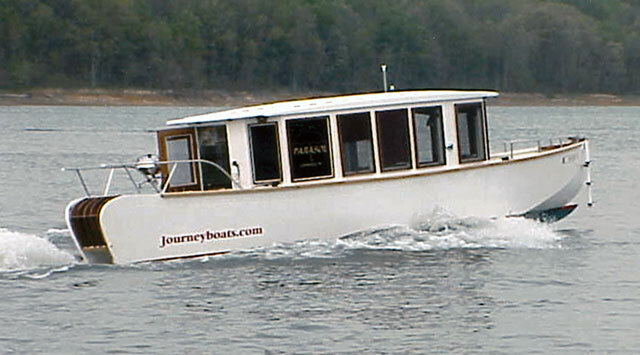 Dwight plans to use her on one to two week cruises all over the Eastern United States. He uses a 60 hp Mercury 4-stroke engine to get PARASOL around on the water when he is not trailering her to his favorite cruising destinations. E-mail for Dwight is at wjacobus@insightbb.com.